Excited to pick up your copy of The News Man – Sixty Years of Television? 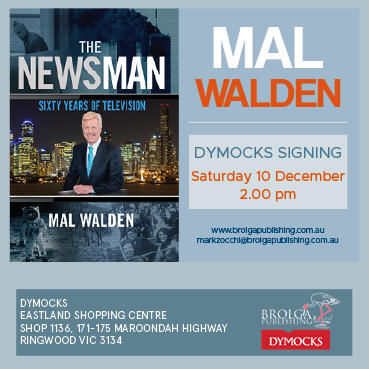 The News Man is a breakout book detailing not only the stories that shaped a nation as they broke but also constructed with the recorded journal entries of the serendipitous and life-changing moments Mal experienced as he became not only a beloved Australian icon but the longest serving news presenter in Australian television history. The News Man takes us to the front lines of the news but also to the cutting edge of the evolution of Australian television. This is a must-have read for anyone interested in Australian history and television. Perfect gift for Christmas too! This entry was posted in Uncategorized by Admin Brolga Publishing. Bookmark the permalink.